Today, as the new government took oath in Jammu and Kashmir, I was thinking of the price we have paid as a nation for this to happen. Even as the debates ranged from what will be priority, to AFSPA, to the new Chief Minister’s statements, to Sajad Lone becoming part of the government, my thoughts turned back to the time when the problem in Kashmir first hit us. There never was a good war or a bad peace – Benjamin Franklin. Starting in October 1947, Pakistan employed regular troops along with militants to attack and capture areas in the Kashmir Valley in different sectors. Pir Panjal Range divides Jammu & Kashmir into two halves. Srinagar Valley is on the north east part and Poonch Valley is to the south west. The Pakistani army and the Raiders had attacked the Uri – Baramulla sector in Srinagar Valley first, where they were defeated and evicted. They started making advances in the Poonch Valley, massacring non Muslims in Mirpur, Kotli, Jhangar, with the aim to capture Naushera. If they had captured Naushera, the entire state, south west of Pir Panjal would have been effectively cut off. It is important to understand this background before reading about how the Indian Army saved Naushera and the courageous acts of our soldiers. 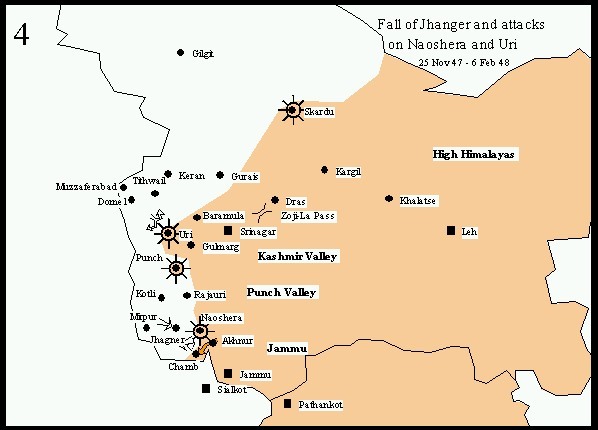 By 25th December 1947, Pakistani army had deployed troops around Jhangar and had captured it. They planned to attack Naushera from the Mirpur – Jhangar axis and capture it. 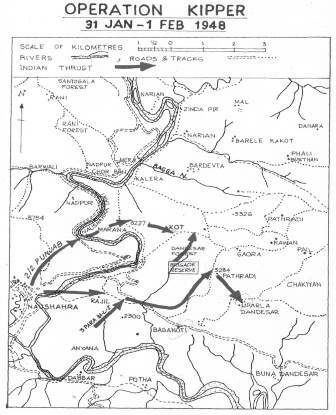 To save Naushera, the axis and the road had to be denied to the enemy. This task was given to Brig Mohammed Usman, one of the 16 Brigadiers of the Indian Army at that time. He was given command of 50 Para Brigade in December 1947 and was asked to cut off the link for the enemy soldiers. was secured and played a significant role in inflicting heavy casualty on the infiltrators, who numbered up to 10,000 just a week later. In one of the firecest battles fought, over 900 enemy soldiers died and the attack on Naushera was stopped. This became a major turning point in the First War of Kashmir and Brig Usman came to be called as Naushera ka Sher or the Lion of Naushera. Three days later 50 Para Brigade successfully moved into Jhangar, reclaiming lost territory. This irked Pakistan so much that they announced an award of Rs 50,000 on Brig Usman’s head, while he asked for a charpoy and slept peacefully in months. Unfortunately, the fruits of success were short lived as far as the brave Brigadier was concerned. The continuing fight with Pakistan denied him the pleasure of basking in that success and he died in heavy artillery shelling on July 3rd, 1948, at the age of 36. His last few words before dying were, “I am dying, but let not the territory we are fighting for fall to the hands of the enemy.” His death was a blow to the Indian Army and his state funeral ceremony was attended by the then Governor General Lord Mountbatten, Prime Minister Nehru, Union Minister Maulana Azad and Sheikh Abdullah. For his bravery of exceptional order, dedication and valour, he was decorated with Maha Vir Chakra. An inspiring leader, he believed in walking the talk. He set an example of personal courage, great qualities of on ground leadership and devotion to duty. His memorial in Jamia Milia University stand testimony to this true son of India. The battle of Naushera saw some fantastic bravehearts, who laid down their lives to help us save the Valley. Subedar Gopal Singh of 3 Rajput, undeterred by the numerical superiority of the Pakistanis, with his men fought valiantly for seven hours. He and his men were responsible for inflicting heavy causalities on the enemy. He led a bayonet charge to separate the attackers. He got isolated and was wounded in the ensuing fight. Sepoy Sikdar Singh found him and carried him back to his platoon. Havaldar Mahadeo Singh assumed command and continued the firing. However, enemy fire killed him on spot. All three were decorated with Vir Chakra. Lt KS Rathore of C Company, 1 Rajput was yet anther hero who defended Taindhar Ridge and kept the fight on against approximately 1500 Pathans who had crossed over. He moved from bunker to bunker, aggressively encouraging his men to keep up the good fight. At one stage, the enemy came within 50 yards of of the bunkers. Havaldar Dayaram, part of C Company, adopted an ingenious method of firing 3 inch mortars without secondary charges. He started dropping the bombs within 50 yards of the bunker lines without any regard to his safety. This thwarted the enemy approach and also killed many of them. 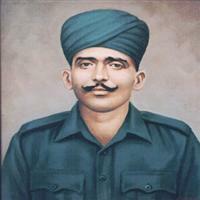 Naik Jadunath Singh was another determined soldier from C Company who displayed great valour and exceptional leadership. He moved his men to additional trenches that were prepared, in such a way that his small group of men, with controlled firing, brought down the Pakistani army from which ever side they attacked. At the most critical stage of of the battle to defend Taindhar Ridge, Naik Jadunath Singh, left with no option, came out with his Sten gun and started firing into the enemy lines. The surprised enemy fled in disorder and this valiant Rajput met a gallant death as two bullets hit him squarely in the chest and head. He had made the ultimate sacrifice. 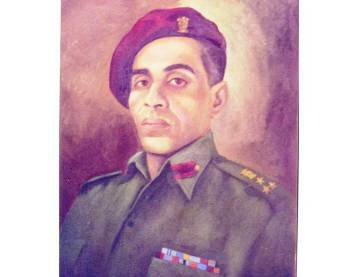 Naik Jadunath Singh was decorated with the Param Vir Chakra. Lt Rathore and Havaldar Dayaram were awarded the Maha Vir Chakra. The threat to Naushera was eliminated over months and months of fighting in sectors and finally on 20 November 198, Poonch was freed and a link up took place. The battles to save Jammu and Kashmir have been fought over a period of 60 years. What started as overt fighting, today includes covert fighting to a large extent. We are in a constant state of conflict with Pakistan over this issue. In the bargain we have lost hundreds and thousands of precious lives – on both sides. Today, we have enormous possibilities of new beginnings. cautious optimism, instead of total negativity will save the state from further destruction and pave the way for future generations to reinstate the glory of that beautiful state. This entry was tagged battle, government, growth, Indian Army, Jammu, Kashmir, Maha Vir Chakra, naushera, Pakistan, Param Vir Chakra, Pathans, peace, Poonch, progress, Valley, war. Bookmark the permalink.